Much-needed change rooms and storerooms, a kiosk, first aid room, umpire’s room and public toilets will replace the existing outdated toilet block. City of Wanneroo Mayor Tracey Roberts said the new building aimed to cater for the City’s growing population and provide more recreational opportunities for local clubs. “The City of Wanneroo grows by 8000 residents each year, and as the population increases, so too does the number of clubs requiring suitable facilities for their players,” Mayor Roberts said. “This new facility will allow Edgar Griffiths Park to play host to sporting teams and better support our community to be healthy and active,” she said. 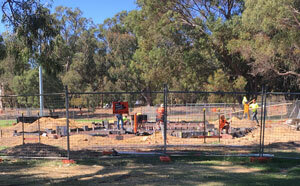 Wanneroo Junior Football Club has been a regular park user for many years. “It is fantastic to see construction has started on the new clubrooms at Edgar Griffiths Park,” Wanneroo Junior Football Club President Mick Willcocks said. “We have been using Edgar Griffiths as a training ground for many years now and we’ve also held some Sunday morning games there,” he said. The $1.65 million project is scheduled for completion in October 2019. In addition, the playing fields on Edgar Griffiths Park have been extended to accommodate senior sports and new floodlighting has been installed.